The last day of our first ever summer mountain bike camp came too fast for us, and we went through our daily morning routines with bittersweet regularity. Though everyone was thoroughly exhausted and beat up from the daily conquering of mountains, not one of us wanted it to be over quite yet. To celebrate the last of so many great rides that the students had experienced throughout the week, today’s adventure was to explore the Overend Mountain Park just west of town. Named after the bicycle racer Ned Overend, this system of trails has just about everything a mountain biker could dream of for a full day of fun and “knar shreeding” as the kids are saying these days. 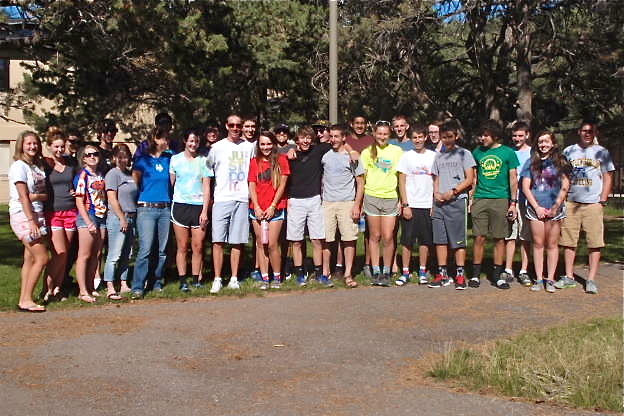 Most of the groups stayed out extra long to soak up the last remaining moments of these sacred and famed trails of Durango, CO. I caught up with several of them after the ride to see what we were all missing. Boone: It was so fun! The trail was nice and tacky from the rain we got last night. It was fast and flowy. Alex: It was fun to watch Steven from Devo shred knar. He had some good flow. Boone: Yeah he had some flow. It’s awesome to ride with locals because they know the trails really well. What did you learn on the ride today that you didn’t know before? Alex: There are a lot more trails out there than the ones that are marked. The trail system is never ending around here! Boone: I learned again today that fast is good. Tacky trails are good. Descending is very good. Ruts in the trail are not good. Slippery roots are not good. But fig bars are good. Alex: Yeah, things got pretty schralpy today. What was your favorite part of the trail today? Boone: That climb up Hogs Back was steep and awesome. Alex: It was very rewarding. Boone: The descent on the other side was the radness. I didn’t know I could go down that much steep stuff for that long without being killed. Steve suggested that we do it; it wasn’t in the ride plan for the day. Alex: The local sweet elite. Alex: The climb up Hogs Back was the hardest part of the day. Boone: Yeah. That and excepting that the ride was over. Alex: Yeah, having to go back to the dorm. That was hard. Alex: I guess you could say that. Final answer; Yes I do. Boone: I would say Chad Cheeney is the radness. Alex: He is a total schralper. He has a serious side but he is also comical. Boone: I like everything. Just everything. Alex: Yeah I would say everything. The town, the trails, the temperature, and the people here. 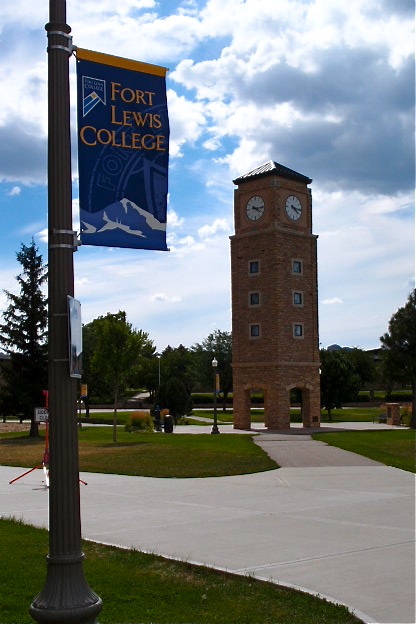 What do you like about Fort Lewis? Boone: Everything. Except for Chinese food day in the Student Union cafeteria. Alex: I like that it is secluded and the town is real close. Betty: I was in the third group today; I liked our ride. It was muddy today and it was really different from anything I have ridden in Texas. It was a great experience. Betty: I think with every ride I am getting better at cornering and breaking suddenly behind people. 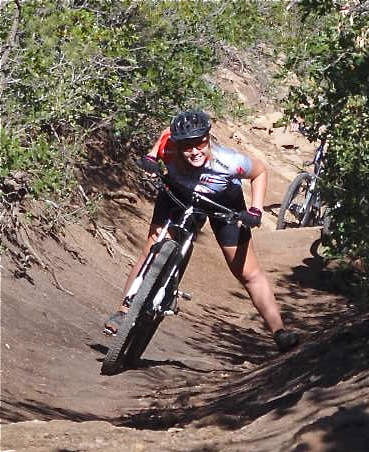 I am getting the hang of standing while going downhill. I am also getting better at the attack position. Betty: I would say the downhill part. It was super muddy and there were ditches to navigate in and out of. It was really fast and fun. Betty: All of the uphills. I tried going up this one really big hill that only two of us tried. We only made it halfway up; it was so steep and long and had stumps that messed us up so we turned around. My gears were starting to mess up so that didn’t help either. Betty: Yeah I miss them both. Its kinda hard being without them because we normally spend so much time together. At the same time, it’s cool to be here on my own too. Betty: I would say Elke is my favorite. She is really outgoing and funny. She watches me and tells me what I am doing wrong with my form and how I ride. She slows me down when I am going too fast and starting to get out of control. Betty: I like the mountains here, they are beautiful. It’s good to get out of Texas and be somewhere completely different for a while. Betty: I like how it’s so free to be who you are here. There is so much to offer – kayaking, rock climbing, cycling – whatever you want to do. Abby: Overall I would say it was pretty good. It was tough; I never thought the climbing would end. The views today were awesome though and worth it. Abby: That I am a better rider than I think I am. 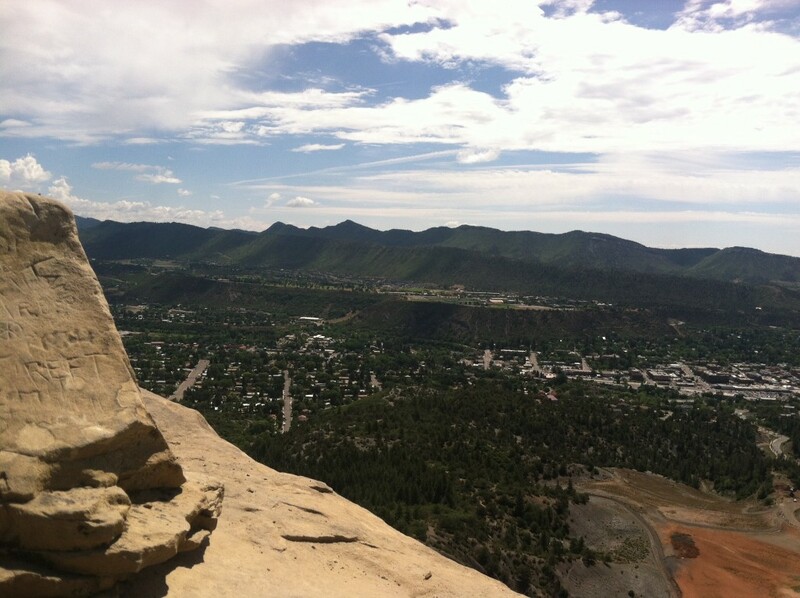 Abby: I liked the beginning of the climb. My legs were fresh and I felt strong. Abby: Getting back on my bike after my crash. It happened at the bottom of a really steep and long descent. I had thoughts of wanting someone to come and pick me up in a car and take me back to campus. I really wanted to make it all the way down that descent! I am pretty sure I crashed right when I thought I might. Abby: No not really. I am about to go to off college so that is good. I have been staying in touch with them for the most part while I have been here. Abby: I don’t really have a favorite. Today I would have to say that I really appreciated Dave and Andrew. Andrew was so positive throughout the whole ride. Everything he and Boone tell me stays with me – like to stay aggressive in my riding. Every time we stopped Andrew told me I was doing great, which was encouraging. Dave was really patient with me today too. Earlier in the week Sarah noticed something about my bike that really affected my riding style. She adjusted my brakes so I wasn’t reaching down for them. After she made that little adjustment, I could instantly ride better. She has great attention to detail. Abby: The weather nice and cool here, and I like that it’s a small town. 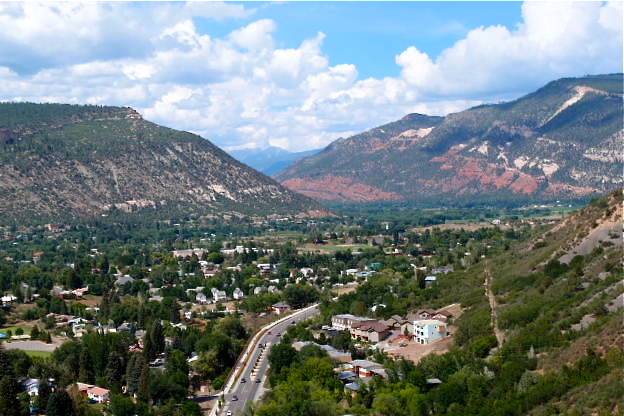 Durango is so pretty. Especially at night; you can see so many stars and I love the way the nearby cliff looks with the moon shining on it. Oh, and everyone here is wearing Choco’s! Abby: I like that it’s a small school. The school I will be going to is small too. I like the way the buildings look; they are nicely designed. I also like how the campus sits on a hilltop overlooking the town. Throughout the week we had all learned about taking care of our bikes, taking care of our bodies, taking care of our spirits, or happiness, and on this last session of the camp it was time to concentrate on how to train the mind. 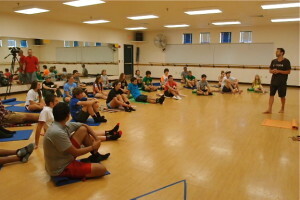 We all marched over to the Sky Hawk Hall (to the same room Elke had gathered us earlier in the week) to learn about Mental Preparation with Steve Ilg. Steve is a world-renowned yogi, athlete, coach, and all around guru. He has been teaching a method he calls Wholistic Fitness since 1982, in which training for any sport is centered around yoga and meditation. He talked a lot about the Ego part of our minds; the part that protects the “I, me, and mine”. The ego is the voice in your head that says, “I’m tired…I can’t do it…my ___ hurts.” The key is keeping your ego on a short leash and training your mind to stay focused, and surprisingly enough, empty during an effort or a race. When we do well at a sport, our minds are not thinking of anything. We are in the present moment. He pointed out that our bodies merely follow our minds, and so our performance on the bike rests with our ability to train our minds. The easiest way to start doing this is by simply sitting and breathing for just a few minutes every day. This is so much more difficult than it sounds. He suggested that we all straighten up our posture and sit completely still and straight for the entire hour we were with him. Many couldn’t do it. It really hurt to try! After just a few moments, I could hear that little voice grow in my head. Telling me to stop; complaining and trying it’s best to convince me. 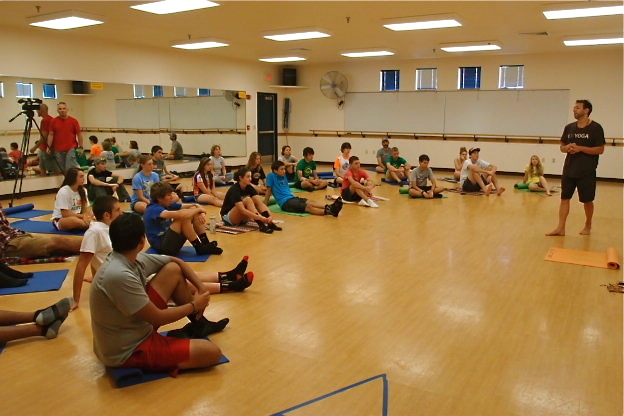 It all made so much sense; it was hard to believe that most coaches and training regimens leave out this key part of learning and growing as an athlete. After such a serious and mind expanding session with Steve Ilg, it was only fair to end the day and (officially) the week with a light-hearted game of bike polo! Chad Cheeney and wife Annie led us to a field at the edge of campus to teach us how to play. The backdrop to this scene alone was breathtaking – it was as if we were playing on the edge of the world; an entire range of mountains rose up all around us past the mesa in the afternoon sun. 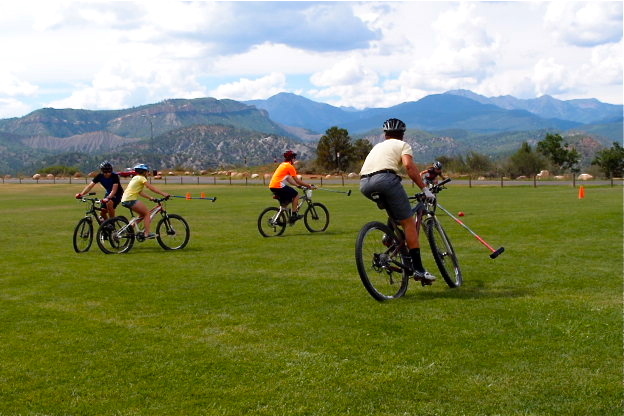 Bike polo works much like horse polo – you have a vehicle, a mallet, a ball, and a goal on either side of the field. The tricky part is maneuvering all of these things independently. The bike often gets in the way of your mallet’s range of motion, the momentum of the ball, and your teammates bikes. What the game does for the rider’s ability is so beneficial, and this is almost a side effect to all of the fun it looks to be. It develops balance, in-the-moment problem solving, coordination, and teamwork. Most of the students and coaches opted to play, and started off with a practice session to get the feel for how it all works. 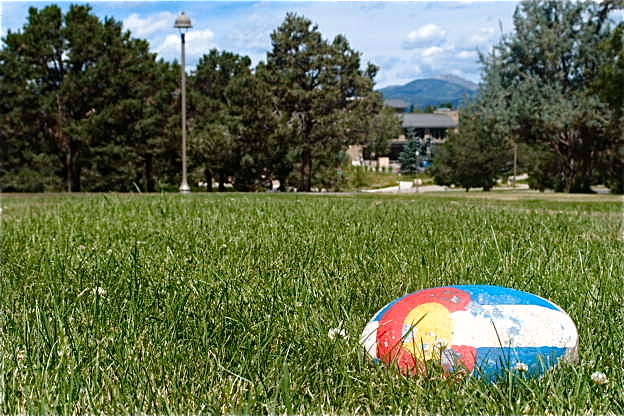 At first there were a lot of bikes colliding, mallets smashing into gears, and balls that seemed to be stuck in place to the grass. But after splitting into two sets of teams and playing for even just 10 or 20 minutes, the miscalculations had already become considerably less and a real game was soon underway. The students absolutely loved it and some of the coaches were making mental highlighted and underlined notes to incorporate bike polo into their own team activities back home. You can see a bunch of great shots from the game here. Back at the dorms at dusk, Vance McMurry gave his final speech to the student athletes, supported by some of the Fort Lewis College and Durango Devo crew. Every single person that had attended the camp had accomplished so many things and had made so much progress; both on and off the bike. 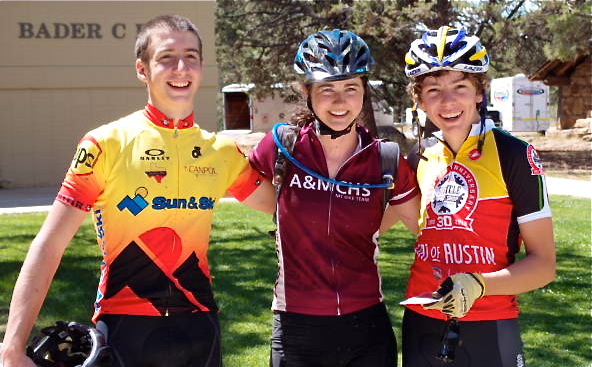 We had witnessed new friendships, breakthroughs in riding abilities, confidence levels, and teamwork that these students can take with them in all areas of life. And even though we had spent so much time listening to and picking the brains of some of the most accomplished and iconic athletes in the sport of cycling, Vance wanted to remind us that the League and this summer camp are not about attending Fort Lewis college or about going pro and taking up cycling as a career. It’s all about opening cycling up as a lifestyle; it’s about living a full and healthy life – on purpose – and having the time of your life doing it. We all went around the room before breaking for the night and shared what we had learned from the week. Philip Romo learned to enjoy climbing. His week gave him the ability to last longer on the bike when things get rough; he has more endurance now. Nick Gerard is excited to go home and feel super fast, blasting up his home town’s true 30 second climbs. Summer Bewick learned how to better pace herself, something her coaches have been trying to teach her since she started riding. Chad Bobbit learned so many new skills on the bike. He loved the amount and variety of the trails in the area. John Miller learned to love cycling again on this trip. He had been feeling burnt out and being here had re-energized his desire to get out and ride. 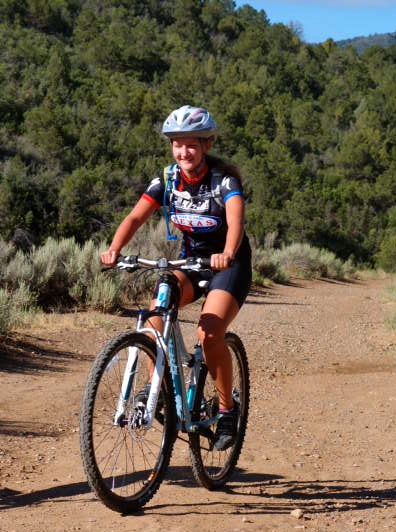 Lily Kohles learned how to control her speed while descending and she improved her climbing abilities. And Peter Drury enjoyed all of the different perspectives given about the sport from all of the local coaches and pros that we talked to. The next morning, we were fed, packed, and on the road by 7:30am back to the flatlands of Texas. Had we taken a vote, we surely would have stayed another week. Just to experience it all over again. The talented Philip Romo had spent the week filming, producing, and editing a video that captures some of the fun, so we wouldn’t miss it all too much.